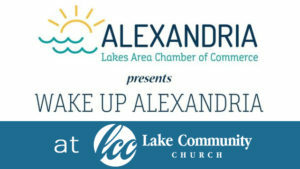 Wake Up Alexandria hosted by Lake Community Church on March 1st! Bring a $1.00 and a business card and enjoy! Join us for Wake Up Alexandria hosted by Lake Community Church on Friday, March 1st from 7:30 – 8:30 am! Learn more about the organization, network with attendees, enjoy coffee and a light breakfast, and hear more about what’s going on in our community! Wake Up Alexandria is a networking event hosted at Chamber member locations on the first and third Friday of every month from 7:30 to 8:30 am. The event is open to members and non-members! A “buck and a business card” gets you in the door and all dollars raised are donated to a non-profit Chamber member chosen by the host business. Members have the opportunity to make a brief announcement about their business to inform attendees on upcoming events, promotions or any additional information.